Can Social Media and Lead Generation Coalesce? By now, we all know that social media is a fantastic tool for gauging the audience and communicating with previous and current customers. But, can it also be used to lure in new customers? Can social media marketing be paired with other lead generation tactics to create new business opportunities? My initial response was, ”mmh, maybe”. Recently, I was asked to speak about “Social Media for Driving Leads.” At first glance, it felt as though I had been asked to open a jar of pickles with my feet – there are so many better ways. After giving it some consideration and thinking about social media as a lead acquisition tactic, I suppose that it’s plausible. However, I will still contend that social media is best served as a method for retention and engagement, while social media marketing can be utilized to garner new leads and revenue. 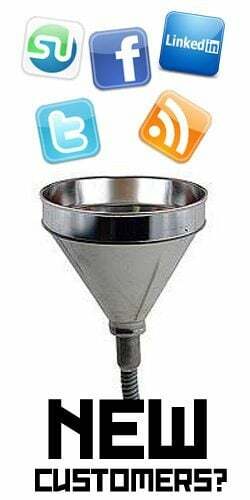 If new, qualified lead generation is your objective, here are three strategies to employ within social media marketing. 1. Create – Develop Amazing Content Always. No matter what your marketing goal, people will always gravitate toward terrific content. Content that educates, entertains, inspires, enlightens and/or enrages has magnetism. By creating a content strategy for your social media program, the process for creating new content becomes much easier. Give your current contacts, followers and fans something they’ll want to talk about and share. In doing so, you’ll no doubt add some to the roster. 2. Listen – (Or at least eavesdrop). I recently introduced Twitter Search to a social media novice who sells pet products, specifically those for puppies and kittens. She was shocked to see how many people were using the words “new puppy” in their tweets. It also came as a great surprise to her how often these mentions just continually rolled in, minute after minute. The trick, then, is what to do about it. Given a set of conversations that are contextually relevant to a product or service you provide, you could: a) follow those people, b) create and publish content that specifically addresses their issues/questions, c) identify other influencers within social media circles with whom you can create relationships, d) all of the above. So what do you think? … The best answer in my humble opinion would be “d”. They are all viable options given the scenario, but show caution in exhibiting just one of these. Simply following an individual might not be enough (and could seem a bit creepy and intrusive). Creating new content can be ineffective if your real targets don’t know that it exists. Finally, developing relationships with other influencers is always preferred, but be sure you have the authority over your message so it doesn’t get muddled. 3. Engage – Spur On Those Already in Your Camp. This is going to sound like a Yogi-ism, but nothing is truly viral until it actually is. Developing a program with the intent of growing your base exponentially is often times wishful thinking. However, there are a few things one can do to encourage existing fans to spread the word. First, ask open ended questions to allow fans to provide answers for all (their friends) to see. By eliciting feedback and input from your loyalists, you may draw in others with similar interests and needs. Second, develop incentives, contests and promotions only available to current fans and followers. Make the incentive great enough that others would want to join. Finally, simply take part in the conversation yourself. Similar to asking questions, be proactive in commenting on your fans status, retweet their posts where it makes sense, and share information they have provided. Giving kudos, providing your own feedback and thanking your customers in this public forum not only serves your current fans well, but it solidifies the legitimacy of your brand in social media by making it human – a trait to which every company active in social media should aspire. Tactically speaking, there are several methods of generating new business leads and prospective customers via social media marketing. Facebook, Twitter and Blogging are great for B2C companies. For B2B relationships, Jason has created a great presentation on using LinkedIn. No matter your marketing goals, consider social media as primarily a public relations, retention and customer service tactic. The new business you derive from it are simply gravy. How do you or your clients use social media marketing for lead generation?